SORRY, THIS TRIP IS CURRENTLY FULL AND RESERVATIONS ARE CLOSED. RESERVATIONS FULL! CALL 205-322-5326 to be added to the wait list. You must request a reservation by clicking the links above or calling 205-322-5326 between 9:00 am and 5:00 pm. Space on trips is given on a first-come, first-serve basis. Once a trip is full, you may request to be added to a wait list and notified of cancellations. If you make a reservation and then discover you cannot attend, please let us know so we may offer the canoe to someone on our waiting list. 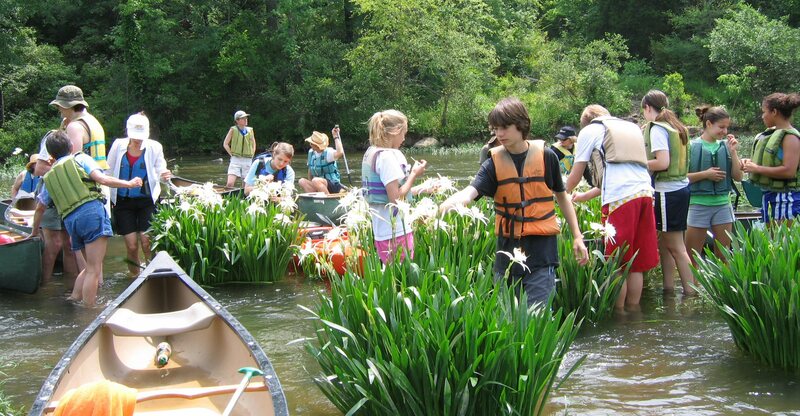 Participants are required to follow the trip leader’s guidance regarding safety and behavior, including always wearing shoes and always wearing a life jacket (provided) when you are in a canoe and no alcohol use during the outing. You should bring your own lunch. Remember that being outside in hot weather will require much more water than usual to keep you hydrated. HATS and SUNSCREEN will save you great discomfort! Novice paddlers are encouraged to attend a training session directed by instructors with the Birmingham Canoe Club. For additional details, see “CLASSES” button at www.birminghamcanoeclub.org.